This agreement marks our third venture with Behringer Harvard and Realty America and we look forward to a long-term successful partnership that will create the leading 'urban resort' development in the Dallas marketplace. Kimpton Hotels & Restaurants Group, LLC, the leader in the boutique/lifestyle hotel segment, today announced plans to open the Hotel Palomar Dallas, a nine-story hotel and 10-story condominium tower situated in the heart of Dallas’ thriving Park Cities neighborhood. Owned by Realty America Group and Behringer Harvard, Kimpton Hotels has been selected to manage and operate the Dallas hotel and restaurant and implement its signature style, services and amenities to embody the elements of the Kimpton brand – care, comfort, style, flavor and fun. Slated for completion in August of 2006, this $90 million transformation of the Hotel Palomar & Residences marks the first property in the Kimpton portfolio to be redeveloped as a mixed-use complex. "Kimpton has been aggressively seeking ways to build brand presence in Texas," said Niki Leondakis, Kimpton’s Chief Operating Officer. "The Hotel Palomar Dallas presents a perfect introduction of our brand and we look forward to showcasing Kimpton’s unique signature design, programs and services that will soon become an integral part of the Dallas community." Formerly The Mockingbird Hilton, Hotel Palomar (http://www.hotelpalomar-dallas.com/) is undergoing a complete transformation and renovation including the remodeling of all 185 guest rooms, an addition of a full-service bi-level destination spa, Exhale, and the launch of a Kimpton chef-driven restaurant. Development plans also include a new 10-story condominium tower south of the hotel with 70 high-end residential units, luxury penthouse condominiums atop the hotel tower, contemporary loft-style condominiums facing Mockingbird Lane, and over 25,000 square feet of ground retail space. "The Hotel Palomar Dallas will be unparalleled in terms of style, design and services," said Mike Depatie, Kimpton's president. "This agreement marks our third venture with Behringer Harvard and Realty America and we look forward to a long-term successful partnership that will create the leading 'urban resort' development in the Dallas marketplace." Kimpton also has recently announced additional Hotel Palomar’s in Arlington, Virginia, Washington D.C., and Westwood, Los Angeles. Founded by Bill Kimpton in 1981, San Francisco-based Kimpton Hotels & Restaurants is a unique collection of boutique hotels coupled with chef-driven, destination restaurants. While all Kimpton Hotels are thoughtfully appointed and managed to help guests maintain and enrich their lifestyles on the road, each is individually designed to reflect the energy, personality, and pulse of its distinct location, history, and architectural style. Featuring highly personalized guest services, comforting in-room amenities, and one-of-a-kind specialty rooms and suites, Kimpton Hotels provide travelers with welcoming atmospheres that embrace its signature elements of care, comfort, style, flavor, and fun. Kimpton takes pride in its social responsibility, supporting select like-minded partners and is a leader in ecological practices. Kimpton currently operates 39 boutique hotels with restaurants throughout the United States and Canada. This includes the recently acquired Caleo Resort & Spa in Scottsdale, Arizona and The Muse Hotel in New York’s thriving theater district. In 2005, Kimpton launched the Hotel Solamar in San Diego and re-launched the Mayfair Hotel & Spa in Coconut Grove, Miami. Kimpton will debut the Hotel Palomar, Washington D.C. in mid-2006 and the Hotel Palomar, Dallas in August, 2006. Several additional projects are currently underway in Southern California, Texas, Florida, and Virginia. 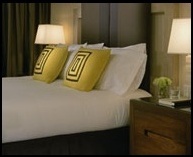 For more information, please visit http://www.kimptonhotels.com or call 1-800-KIMPTON.